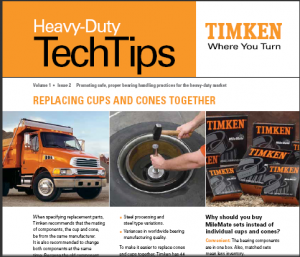 When specifying replacement parts, Timken recommends that the mating of components, the cup and cone, be from the same manufacturer. It is also recommended to change both components at the sametime. Because the old component has a distinct pattern worn into its raceway, mixing it with a new mating component may set upedge stresses along the races.